GREPL Jakub grounds out. 6-3. 1 out. 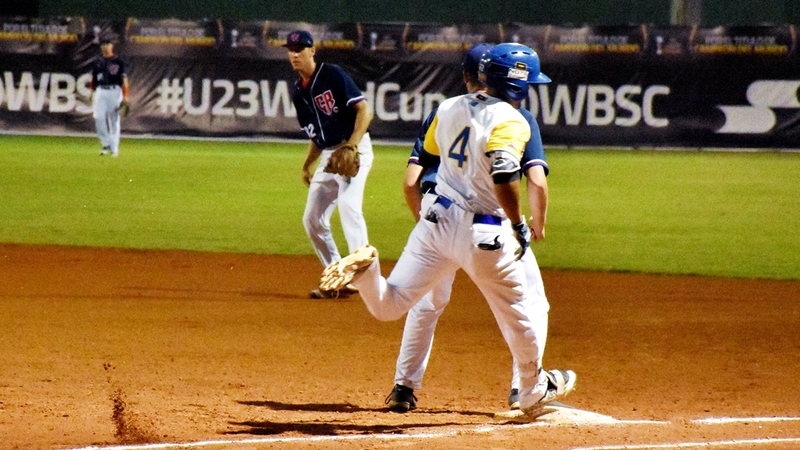 MUŽÍK Martin flies out to left field. F7. 3 out. PEREZ BLANCO Brallan Andres grounds out. 5-3. 1 out. VIDAL VARGAS Carlos Andres reaches on error. E-4. ZABALA MURILLO Juan Camilo grounds out. 6-3. VIDAL VARGAS to 2nd. 2 out. Ball 2. VIDAL VARGAS to 3rd on wild pitch. TORRES CHAVEZ Jhon Hansser grounds out. 5-3. 3 out. FURKO Ondřej grounds out. 6-3. 1 out. NOVOTNÝ Radim flies out to right center. F4. 2 out. DIAZ SANDOVAL Jordan David strikes out swinging. 1 out. RAMOS MEZA Milton Alain singles to left field. CAMARGO ALONSO to 2nd. MARRIAGA MONTALVO Jesus Adalberto reaches on error. E-5. CAMARGO ALONSO to 3rd. RAMOS MEZA to 2nd. PEREZ BLANCO Brallan Andres singles through the right side. CAMARGO ALONSO scores. RAMOS MEZA scores. MARRIAGA MONTALVO to 2nd. MARRIAGA MONTALVO to 3rd on E9. PEREZ BLANCO out at 2nd 96. 2 out. 2 RBI. VIDAL VARGAS Carlos Andres reaches on error. E-6. MARRIAGA MONTALVO scores. Ball 1. VIDAL VARGAS to 2nd on stolen base. 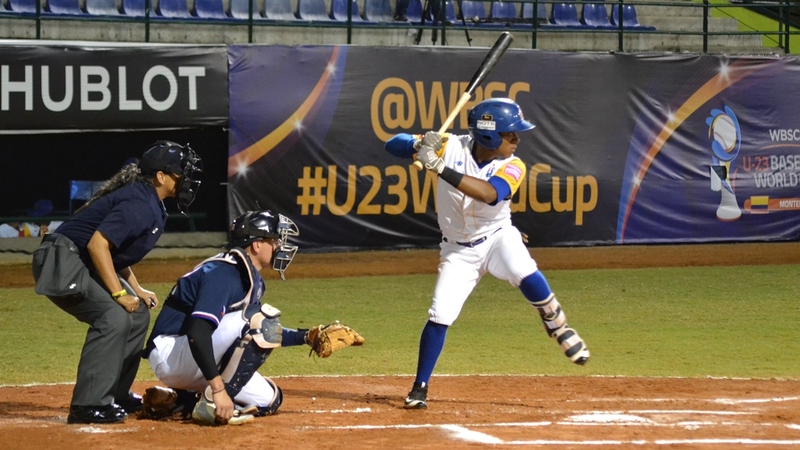 ZABALA MURILLO Juan Camilo grounds out. 6-3. 3 out. TRUNKÁT Lukáš flies out to center field. F8. 1 out. KALÁBEK Martin grounds out. 4-3. 2 out. ONDRÁČEK Jakub singles down right field line. Ball 1. ONDRÁČEK to 2nd on stolen base. POSSO MANRIQUE Jesus Francisco strikes out looking. 1 out. TORRES CHAVEZ Jhon Hansser reaches on error. E-1. CAMARGO ALONSO Jair David doubles to deep center field. TORRES CHAVEZ scores. 1 RBI. DIAZ SANDOVAL Jordan David hits into a double play. DP 54. CAMARGO ALONSO out at 3rd 5. 3 out. MUŽÍK Martin grounds out. 6-3. 2 out. RAMOS MEZA Milton Alain doubles to deep center field. MARRIAGA MONTALVO Jesus Adalberto grounds out. 4-3. RAMOS MEZA to 3rd. 1 out. PEREZ BLANCO Brallan Andres flies out to center field. Sacrifice Fly. SF8. RAMOS MEZA scores. 2 out. 1 RBI. VIDAL VARGAS Carlos Andres singles up the middle. ZABALA MURILLO Juan Camilo homers to deep center field. VIDAL VARGAS scores. 2 RBI. POSSO MANRIQUE Jesus Francisco doubles to deep left field. TORRES CHAVEZ Jhon Hansser grounds out. 1-3. 3 out. NOVOTNÝ Radim singles to right center. KUBICA Jakub singles through the right side. NOVOTNÝ to 2nd. CAMARGO ALONSO Jair David doubles down right field line. DIAZ SANDOVAL Jordan David singles through the left side. CAMARGO ALONSO to 3rd. RAMOS MEZA Milton Alain doubles to deep left center. CAMARGO ALONSO scores. DIAZ SANDOVAL to 3rd. 1 RBI. Ball 1. DIAZ SANDOVAL scores on wild pitch. RAMOS MEZA to 3rd on wild pitch. Ball 2. RAMOS MEZA scores on wild pitch. MARRIAGA MONTALVO Jesus Adalberto doubles down right field line. VIDAL VARGAS Carlos Andres singles to deep left field. MARRIAGA MONTALVO to 3rd. MARRIAGA MONTALVO out at home 762. PEREZ BLANCO to 3rd. ZABALA MURILLO Juan Camilo flies out foul. FP2. 2 out. POSSO MANRIQUE Jesus Francisco flies out to right field. F9. 3 out. ČERVINKA Martin doubles to deep center field. GREPL to 3rd. 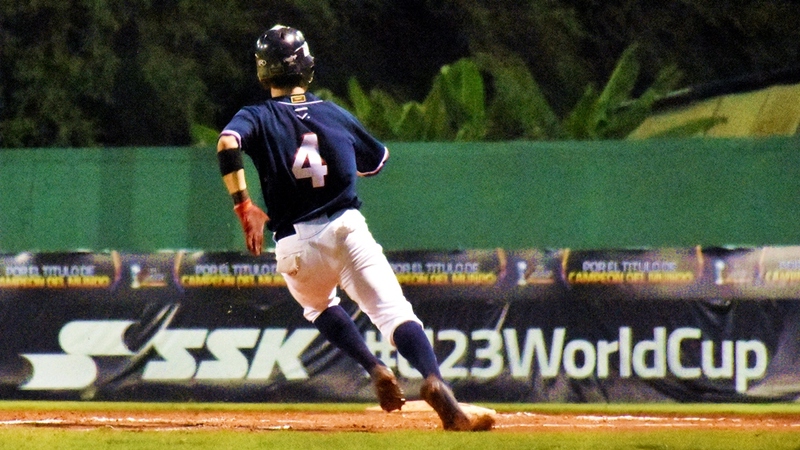 MUŽÍK Martin singles to left field. GREPL scores. ČERVINKA to 3rd. ČERVINKA scores on E5. 1 RBI. FURKO Ondřej strikes out swinging. 1 out. NOVOTNÝ Radim strikes out swinging. 2 out. Ball 1. MUŽÍK to 2nd on wild pitch. Ball 2. MUŽÍK to 3rd on passed ball. TORRES CHAVEZ Jhon Hansser singles through the left side. CAMARGO ALONSO Jair David hits into a double play up the middle. DP 463. TORRES CHAVEZ out at 2nd 46. 2 out. RAMOS MEZA Milton Alain flies out to center field. F8. 3 out. ONDRÁČEK Jakub grounds out. 6-3. 3 out. MARRIAGA MONTALVO Jesus Adalberto grounds out. 3U. 1 out. PEREZ BLANCO Brallan Andres flies out to shallow right center. L4. 2 out. VIDAL VARGAS Carlos Andres flies out to center field. L8. 3 out. ZABALA MURILLO Juan Camilo doubles to right center. Ball 1. ZABALA MURILLO to 3rd on wild pitch. POSSO MANRIQUE Jesus Francisco singles to deep left center. ZABALA MURILLO scores. 1 RBI. Ball 2. POSSO MANRIQUE to 2nd on wild pitch. CAMARGO ALONSO Jair David flies out. F5. 2 out. DIAZ SANDOVAL Jordan David reaches on error. E-5. POSSO MANRIQUE scores.